Special thanks to Petco for awarding our Community Cat Adoption Program a check for $1,244.33 for participating in their Petco Photos with Santa event. As a Petco partner, our organization received the proceeds for every day SAFCC participated and for every customer that came in for photos. Thanks to all that came in and got their photos! In addition to this event, our CCAP team received a check from Petco Foundation for $1,150 for the "All for Holiday Homes" National Adoption Grant Award! This grant is awarded to Petco partner organizations for adoptions during this event. Congratulations to all of the hard-working CCAP folks! All proceeds from both events will provide for the cats in our care. Thank you to everyone who supported our Christmas Bazaar Fundraiser, raising $2,472 for our Adoption Program! We had many donated items to sell and several friends had their own tables to contribute: Mary sold her handmade cat jewelry and earrings; Maria had cute cat teaspoons, Susan had beautiful drawings and For Paws sold handmade cat toys. There were plenty of Christmas refreshments to enjoy while shopping and chatting with friends. We're already looking forward to next year's Bazaar! We have added two weeknight sessions to our TNR Class Schedule at a new location! These classes weren't official in time to be listed on our TNR class flyer so please spread the word. If you have attended a past TNR class and would like to help out at the class, please email us. If you have attended a past TNR class and would like to help out at the classes, please email us. Thanks to board member Monica for agreeing to present at these extra classes! Trappers and colony caretakers...show off your photogenic ferals! We're having a picture contest and want a pic of your beautiful colony cats. Your cat could be the winner and be featured on our TNR Class flyer! To submit your cat, send us those shots of your colony cats in their favorite outdoor spots as well as the name of the cat and your name to contest@sanantonioferalcats.org. If you want to buy some SAFCC merchandise, drop off a donation or just want to say hi, stop by our office on the Second Saturday of every month, from 10a-12pm. Hisses to Tara Apartments on 8501 Broadway in 78209. SAFCC was notified that new management recently changed the rules for tenants who have cats. Now cats must be declawed to live there. Prospective tenants and potential adopters of cats should be aware of this policy. Our Advocacy Team plans to speak to management and provide literature showing why de-clawing is inhumane. Purrs to the New Braunfels Community Cat Coalition servicing Comal and Guadalupe counties. This young TNR organization has a great program set up and ferals are fixed for free! Since their inception 16 months ago, they have spayed/neutered over 1,000 feral cats! If a cat is deemed adoptable, they remove it from the feral program and place the cat for adoption with the New Braunfels Humane Society. Give them a follow on Facebook or check out their website. Before Hurricane Harvey hit the Texas coast, people were scrambling to clear the shelters of animals that were in a life and death situation. Rescues needed to pull the animals or they would be euthanized! SAFCC's Community Cat Adoption Program pulled four litters of kittens and one teenager who was thought to be feral. The Texas Transport team drove the cats to San Antonio on their freedom ride. Three of the litters were transported to another rescue group and we found furrever homes for the remainder. Libby, the one teenager who was thought to be feral turned out to be a quiet, sweet and gentle girl. She was at our Petco Adoption Center at 410/San Pedro and our own board member and Petco volunteer, Megan, fell in love with her. Libby is now living the life! Rocket was adopted by a volunteer's coworker and Basil was adopted and is an only child. Thank you to all who opened their homes and hearts to these babies! Celebrating a birthday? Need to cater a work luncheon? Or just need to re-fuel while shopping? 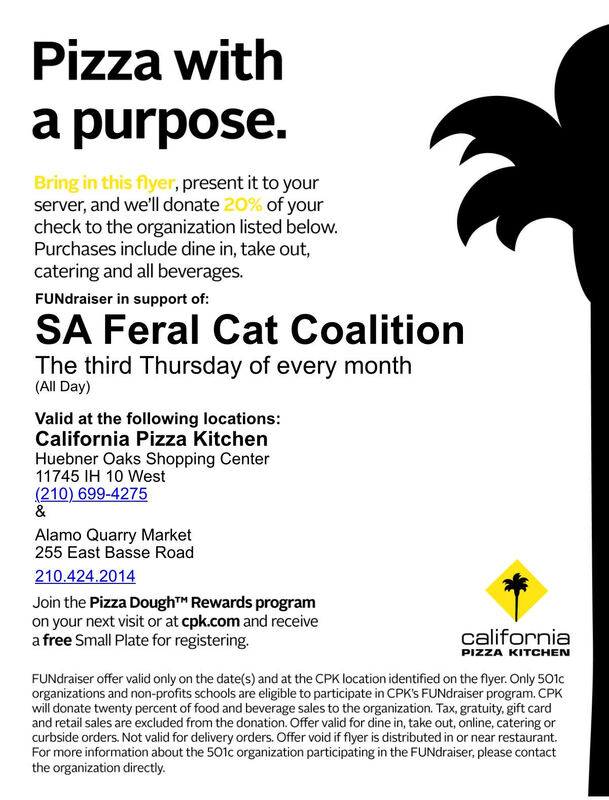 Present this FLYER when you dine in/take-out/cater on February 15 and 20% of your bill will be donated to SAFCC. Help SAFCC help community cats. Save the date for Big Give SA 2018!